Writing is an act of imposture. You are either pretending to be someone else (when you write fiction) or writing in a voice that is a cleaned up version of you. Whatever the case, what’s on the page looks nothing like the person in a t-shirt and dirty shorts with bits of breakfast on his face who is writing it. This is a good thing. Famous writers have worked very hard, even cultivating disguises to make what we do look normal or even cool. Think of Hemingway in his hunting togs, or hanging out in Paris bistros, or Cheever in his suit riding the elevator down to the basement room where he wrote in his underwear or E.B. White with his typewriter on a spare elegant table in a spare, elegant backyard barn. How else can readers maintain the sonorous, impressive voices in which they hear their favorite words in their heads? Because little do they know, in Manhattan at least, us scribblers are everywhere. Our article, story, book or poem may have started out in some more stately location, but then it slips. That’s us scribbling notes in the subway; occupying space in the library and camping out at the café. 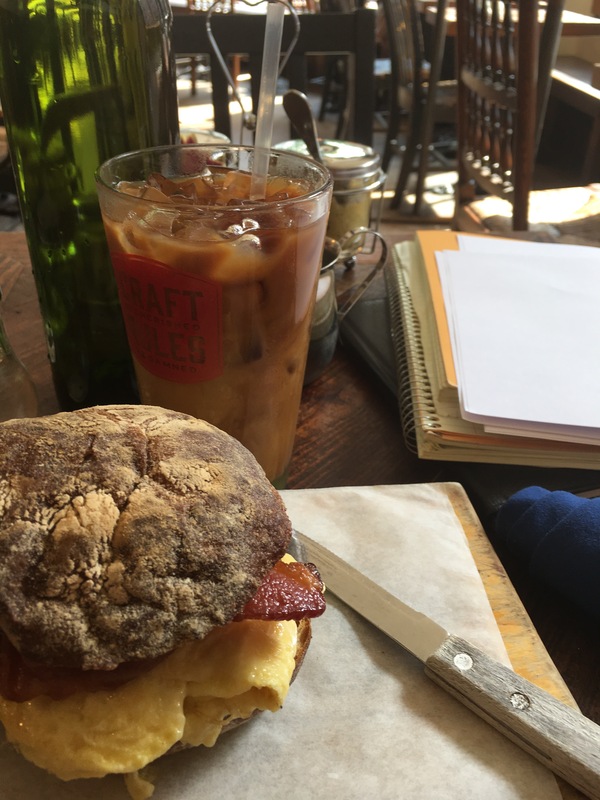 In New York, on a given weekday, depending of course on their willingness to accept us (and the strength of their wifi), cafes are full of writers. Or full of people writing anyway: writing our memoirs, novels, great works of non-fiction, shopping lists, technical manuals, or letters to our mothers. Some of us may look the part more than others. But here’s a tip: The non-writers give themselves away when they take phone calls. Someone who takes phone calls in a café is not a writer. They are a businessperson, using the café as their “office.” This is another kind of imposture. But at least some of the rest of us are real. Once while I was struggling with a short story, I’ll say it was, I noticed a young boy watching me from across Think Coffee. After a while he screwed up his courage and came over. “Are you a writer?” he asked. I imagined that he had already decided he wanted to be a writer and had come to Manhattan, maybe with his parents, and had made his way downtown to see what his future life would look like. So what happened next? Is he in? Did he become a lawyer? One of the weird quirks of being a writer is that you don’t necessarily interact with other writers. We don’t have a water cooler, because we generally don’t work in offices, though we need human interaction as much as anyone else. There are some writers who like to be part of writers’ groups, and associations. I have done that and not done that over the years. But for writers, it’s not easy to chat about what we have in common. Especially since what most of us have most in common is rejection and we would rather not discuss it, thank you very much especially if one of us has more than the other. That is why it is not necessarily a good idea to sit two of us next to each other at a dinner party. Sometimes it’s wonderful, but mostly it’s problematic. If something story-worthy happens at your party, fuhgettaboutit. For New Yorkers, the city is our water cooler. New Yorkers will talk to anybody about anything. How can they not? Life in this city is crazy. For New York writers, to be able to suddenly start talking to the person next to us in myriad situations is priceless for our work not to mention our psyches. It makes us feel connected, important: as if in our daily lives, even if we don’t get any writing done, we are creating conversational manuscripts. As if the city were holding us together. Last year I was invited to fill out a table purchased by my wife’s law firm at the PEN American Center Literary Gala honoring the staff of Charlie Hebdo. I sat next to another writer who had also been included solely on his affiliation with my wife’s law firm and we had a great time chatting about the vicissitudes of our profession. The speeches were inspiring and by the end, walking out with my wife, I felt kind of proud. When we got to the lobby, I was approached by some publicity people from the New Yorker who asked if they could take my picture. They ushered me over to a corner where they had set up a shiny backdrop. I’m not sure if it’s because I’m a New Yorker or because I’m a writer that I went along with it. At the last minute, I whispered to them, reluctantly, that I was not a famous writer. They seemed not to care. All writers deserve fame, they seemed to be saying. We think you’re glamorous, famous or not. They took my picture and then they confessed to me that they had thought I was Colm Toibin. We then walked outside, where we were interviewed by a writer for the New York Post about the controversy surrounding the gala. We went home feeling — as New York almost never makes regular people feel — like celebrities. Last year was a good year for me as a writer but I am not Colm Toibin. I have not read enough of his books to have an opinion about them, but I am happy to share in his reflected glory. Still I don’t really think I look like him. Both of us have heavy eyebrows and not very much hair on our heads but the resemblance stops there. They obviously didn’t mean that my writing resembled his. They couldn’t. Still it felt like good karma. I had started out the year disoriented. It was my first full year without an office downtown. I had been proud of that office, maintaining it on a freelance writer’s income for fifteen years had not been easy. But one of our two daughters had gone off to college and keeping the office had become an end in itself. So I gave it up and worked first from home and then from a library at Columbia. This saved money, but it also meant I had more freedom to work on projects I wanted to work on. And as a result, I managed to get some great assignments and to spend more time on my novel. I had a short story published in a respected publication that now lists my name (Sapers not Toibin) next to Sartre in its index. 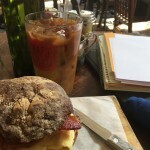 In my new schedule, I spend every Wednesday going from café to café in the neighborhood where my office was, getting the experience of being a writer with celebrity hours, without having to worry about assignments that would pay office rent (other than the many cups of coffee it costs to hang out in cafes). I began to think in an idle manner about whether someone might notice me and think they had glimpsed Mr. Toibin hard at work on a new novel. By celebrity hours, I mean the hours regular people are at their offices, even though they might be at the water cooler. During those hours, many normally bustling parts of New York City are wonderfully magically empty. Fifth Avenue is a beautiful ghost town. The health club is an expanse of open machines. Except for the occasional celebrity. Once while I was working out at two in the afternoon, I encountered John Mayer — I knew it was he because I was playing one of his songs on my iPhone and he noticed and gave me a friendly smile. He also looked like him and I was also able to identify him later (to prove I’d seen him to my wife) by the new tattoo he happened to be wearing on the inside of his arm. There is very little celebrity-like about being a writer. At least a non-celebrity one. Our writing goes out and gets seen while we face the empty page or slink off to buy groceries. One morning, recently, I was doing just that in a store near our apartment on the Upper West Side when a woman looked up at me from the adjacent cash register and gave me the New York we-both-know-you’re-a-celebrity-but-we’ll-just-keep-it-between-ourselves look. “Thanks for the reads,” the woman said. “I’ve read all your books,” she said. “I’ve seen you speak at Symphony Space,” she ventured. “You mean you’re not Colm Toibin?” she asked, disappointed. I decided to take her advice. I was finishing writing this essay on one of my Wednesdays downtown a few months later when someone new appeared at the cafe. It was the week before Labor Day and the cafe was almost empty. Besides a few regulars there was a strangely familiar looking blonde woman with her young child having breakfast at a table in the middle of the room. She was chatting with two men who were also breakfasting and one of the men made a dog for the boy out of a bright blue balloon, which was cheerfully accepted. Then the two men left. Now there were only two others of us there and the waitress. The other one of us had earphones on. The waitress asked the blonde woman where she was from. I couldn’t hear her answer. I looked up at her at one point and thought maybe she was a friend of a friend? Someone I had seen at the cafe before? I went back to work and through the haze I began listening to her husky voice as she read to her son and then discussed with him what he wanted to be for Halloween and which park he would like to go to afterwards. After a while I thought I recognized the voice. It sounded a lot like Clare Danes. I surreptitiously Googled. Did she live in the neighborhood? Was the boy the right age? So far so good. But I didn’t dare do more. What was I going to do, walk up to her and say, “Thanks for the shows”? Because at this point it was my job, as a New Yorker, Colm-Toibin look alike or not, to do my best to pretend she wasn’t there. Otherwise I would break the invisible wall between us fake celebrities and real ones. If she wanted to come over and see whether I was watching Homeland on my phone, that was her prerogative not mine.